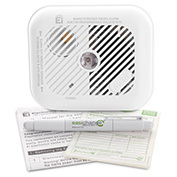 Have you been searching online for an Ei151 Ionisation smoke alarm? Unfortunately, one of the most cost effective and reliable mains powered smoke alarms on the market, the Ei151, has recently been discontinued by manufacturers Ei Electronics. This sadly also means that the revolutionary ‘Easichange’ system conceived and introduced by Safelincs in partnership with Ei Electronics is no longer available for Ei151’s. We do, however, have great news for those looking to extend the life of an existing Ei150 series alarm system. The Ei154 (heat sensor) and Ei156 (optical sensor) models are still available, and are compatible with the connector block and base plate for your existing Ei151 smoke alarm. This means it is possible to purchase an optical smoke alarm (Ei156) as a replacement for your expired ionisation smoke alarms (Ei151). This can be particularly useful if one alarm from a system including several devices reaches the end of its 10 year lifespan ahead of the other devices. Although the Ei156 can, as stated above, be used as a replacement for your expired Ei151 alarm you should note that there is already limited stock of the Ei156 alarm, which is also being discontinued by Ei Electronics. In this case an excellent solution to replace old Ei150 series alarms are the Ei140 and Ei160 series. Ei Electronics have confirmed that the three smoke alarm families will smoothly communicate with each other over your existing wiring system. You need to keep in mind, though, that the old Ei150 series connector plug will have to be removed and the cable ends will need to be inserted into the new alarms, for this action you will require the services of an electrician. The Ei140 and Ei160, series whilst being compatible with the wiring system that you already have, does have a different baseplate footprint than your old Ei151 alarms. You can overcome this by using the masking plate, which covers up the marks that may be visible from the previous alarm and will reduce drafts and dust. Please note: A heat sensor is not an appropriate replacement for a smoke detector. Heat sensors are designed exclusively for installation in kitchens and garages. If you need to replace an Ei151 Ionisation smoke alarm but are unsure of your options, contact us on 0800 612 6537 or via support@safelincs.co.uk. We make the replacement of existing smoke alarms as painless as possible and are committed to help you find the best value outcome – whether that is a direct replacement, or a cost effective alternative.